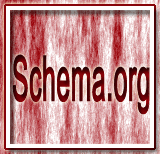 In this page, we have discussed MusicPlaylist type of Schema.org in detail. MusicPlaylist specifies that associated content is about an array of musical tracks in the form of a playlist. numTracks Integer The number of tracks in the associated playlist. tracks MusicRecording A music track. Generally, it is a single song. Google Rich Snippets tool is not very efficient to fetch Microdata. 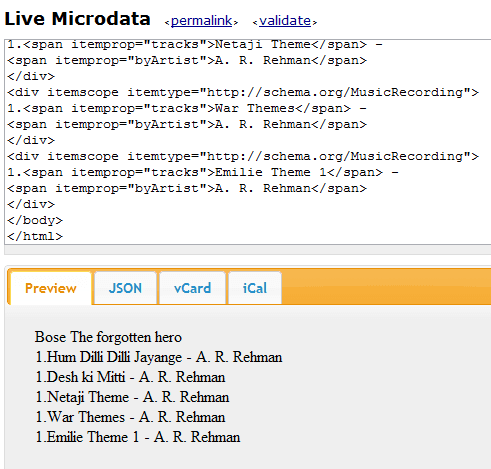 So, we have used http://foolip.org/microdatajs/live/, which is an online live microdata extracter. Simply, copy your html code with microdata and paste it to the pane as shown in the image bellow. And it extracts the microdata and shows in the pane bellow. Click on the valdate link to check if your HTML code is proper. The example code is validated.